A fun two-dimensional fight in which the player faces countless enemies. Despite being based on an extremely simple control model, the game offers immersive and exciting gameplay. The title is a continuation of One Finger Death Punch from 2014. 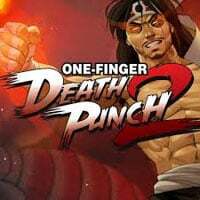 One Finger Death Punch 2 is a two-dimensional, side-scroll fight, a continuation of One Finger Death Punch from 2014. The independent Silver Dollar Games studio is responsible for its creation. The One Finger Death Punch 2 rules of play are extremely simple. The player controls a character standing in the middle of the screen using two mouse buttons or a ray - one is responsible for hitting the left and the other for hitting the right. Our task is to eliminate further opponents coming to us from both sides. Over time, the rate of appearance of enemies gradually increases, and coping with them requires considerable dexterity. The gameplay is varied by additional elements, such as temporary reinforcements falling from the top or weapons left by some enemies, which we can pick up and use. In addition, the creators have implemented a system of skills, which, like the equipment, allows you to modify the fighting style of our hero. One Finger Death Punch 2 is designed primarily as a single player game - whether it's a campaign game (there are many different levels available) or a survival mode where our goal is to survive as long as possible and collect as many points as possible. The production also offers a local multiplayer mode, allowing two people to have fun together. One Finger Death Punch 2 is based on the Unity engine and features colorful two-dimensional graphics. Attention is drawn to the funny, simplified character designs, their attractive animations and spectacular backgrounds.